Young volunteers and the Mayor of Ealing, Barbara Yerolemou, celebrate the unveiling of improvements to Berrymede Primary School’s playground. Thirteen young volunteers have finished a colourful revamp of their school playground just in time for the start of the new school year. 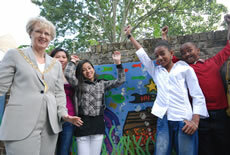 The Berrymede Primary pupils - aged 10 and 11 - today officially unveiled their renovations, revealing flowerbeds, murals and mosaics almost seven months in the making. The work was undertaken as part of the Big Lottery-funded Community Space Challenge, a national initiative to help young people transform public spaces, gain skills and build pride in their community. This is the second project undertaken in Acton under this initiative, after the Ealing Council led Youth Inclusion and Support Panel secured a five-year £58,000 grant.